The search engines have a simple purpose: to offer their users top quality content that is relevant for the searchers’ queries. Google continues to be the #1 search engine because its team understands this perfectly; and while it is true that some of the low quality sites have managed to crawl on the first Google page in the past, the Panda update has pushed the relevant, content-rich, high quality websites to the top of the search results once again. The proof of this was so evident that we decided to offer content creation services for all our customers (for free) about three months ago. Believe it or not, there are people that will copy your content as it is, pretending that it is theirs. In fact, I had that happen to one of my sites a few months ago; somebody has registered a domain that was very similar with one of my sites (he included a dash in the domain name), and then he has copied / pasted all my website pages, blog posts, etc, including my client list, testimonials, and so on. He’s put his name and info on the contact page, of course, but the rest of the site was 100% identical with mine. What about scraped content? Some people will gather information from various sources, using a paragraph from here, one from there, maybe rewording it a bit… basically, they’re adding more low quality content to the web, something that the search engines dislike a lot. Finally, a thin piece of content doesn’t include useful information and / or consists of only a few paragraphs. Sure, you could review a plain light bulb using a 200 words article, but if you’re reviewing (let’s say) the latest gaming PC, it makes a lot of sense to use a meaty 1,000+ words article with lots of pictures in it, and so on. If you want to write great website content, make sure that it is unique and meaty. Google is monitoring your website visitors and it can tell whether they liked your site or not; read the how to future proof your website article for more information on this. Since very few of us are published authors, how can we learn to write great content? First of all, you need to come up with as many content ideas as possible; fortunately, this step of the process is very easy to do. Let’s assume that I am interested in creating great, engaging content for the insurance industry. Actually, one of my clients runs an insurance company, so I can tell you that coming up with original, interesting ideas in this niche can be quite hard, unless you know the secret word: forum. Yes, all we need to do is to Google “insurance forum” (without using the quotes) and we will get thousands of content ideas in less than an hour! Let’s run the search right now. Google has returned over 400 million results here, but don’t worry, we won’t have to browse through them all. Actually, we could repeat the search using the quotation marks this time, and we will get fewer results (less than a million) because they will always include “insurance forum” in this order. I haven’t included more than four forum categories in the picture above, but trust me: there are dozens more, and many of them include thousands of threads! Read the threads that have gotten a big number of views and / or replies, and then write articles that discuss those particular problems, offering the best solution to them. And once you have created the articles, don’t forget to register at those forums, starting a thread that discusses the problem and includes a link to your blog post – you’re going to receive highly targeted website visitors for sure! Another idea is to discover new terms and redo your forum search using them as seed keywords. As an example, an insurance specialist could do an “annuity forum” search if he is interested in learning more about annuities, and then write a meaty article that discusses the various annuity options. Take 30 minutes to go through several forum pages and you’ll get enough article ideas to last for an entire year. Type the keyword / topic that interests you in the “Search query” box, and then choose “Everything” to be notified about news, blogs, videos, discussions, books and the like (or feel free to choose a single category if you want to). How often will you need to be notified about new, industry-specific content? Choose “Once a day” if you blog a few times per week or “Once a week” if you don’t have that much time at your disposal. 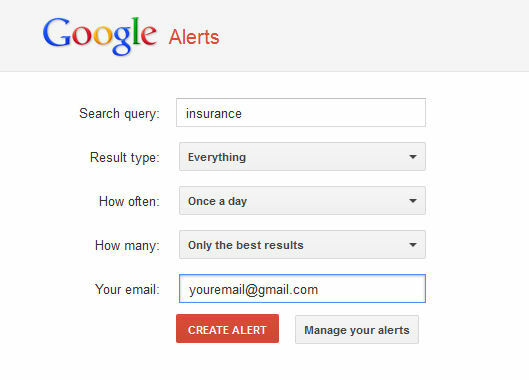 Finally, choose “Only the best results”, type in your email address, and then click the red “Create Alert” button. But don’t limit yourself to a single keyword; feel free to create as many alerts as possible using various relevant keywords. Do that and you will soon discover that you have lots and lots of great content pieces that can serve as an inspiration for your own articles. But what if you need to write an industry-related article right now, and your alerts are set to “Once a week”? 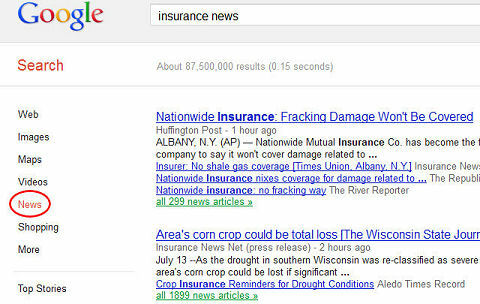 Google “your industry news”, for example “insurance news” (without using the quotes) and you will discover the hot industry topics of the moment. And if the results aren’t exactly what you need, click the “News” section on the left side of Google’s search results page to get access to the most recent news. As both you and I know, Google loves authority sites, blogs that publish great content on a regular basis. As the alerts start sending you content each day or week, you will discover several websites that do a great job, offering high quality, engaging articles to their readers every day of the week. You will want to keep an eye on these blogs, because you may be able to replicate their success. So now we’re at a point when we’ve got article ideas and content inspiration snippets – how do we move on from here? You can find many ideas in the Top 25 ways to beat the blog writer’s block article, but I’ve got a few more fresh ideas for you. Since we can create a specific alert that pulls results from news as they happen, we could write news stories without going through too much trouble. Don’t just copy / paste the news, though; add your own angle to the story – that is exactly what the fine journalists at U.S.A. Today or Times do! Since you have got the article idea and the hard facts, all you need to do now is to add your own thoughts, mentioning the news, and then writing down your honest opinion about it. Another good idea is to create a “Something of the week” post. You could choose to have a video of the week, image of the week, and so on; just make sure to add your own thoughts, writing an interesting, controversial or funny piece of content that fits that video or image nicely. Sure, the things are going to be much easier if you’re working in the fashion industry, for example, but I guarantee that you can come up with good ideas even if you’re working in the insurance industry. As an example, if you sell car insurance, you could have a “funny car crash movie” blog post each and every week. Use YouTube or similar video sharing sites to find the movies that interest you, and then embed them on your site. You could also grab several videos and create a tutorial, teaching your readers how to do something specific. Have you ever thought about using other people’s frequently asked questions for your blog posts? Go to Yahoo Answers, search for your keywords, collect a set of good questions, and then answer them, thus creating the content for a blog post that solves people’s problems. Don’t forget that Yahoo Answers can serve as a fantastic source of content ideas by itself, because it helps you discover the real problems of the people that might be interested in purchasing your products or services. What about case studies? Everybody loves them, provided that they are interesting and offer real value. I have to stop somewhere, but don’t forget about myth busting posts, lists, how to series, and the like –they’re very popular. I know that this was a long read, but I am sure that you now know how to write great website content. Start applying what you have learned right now and your blog will become the very foundation of your online business. To your success!